Waukesha Civic Theatre kicked off its 62nd season with “The Musical Comedy Murders of 1940” written by John Bishop. It is directed by Carol Dolphin. Playwright Bishop starts with all the clichés of an overdone murder mystery: people with a shared past are trapped in a spooky house due to a terrible snowstorm and then discover that they are there (gasp!) with a murderer. He adds what he thinks are the typical standards of a comedy: a character with a long last name which he hopes will get laughs each time it is spoken, overblown caricatures masquerading as real people plus less-than-stellar dialogue and not really clever bon mots which he believes are truly funny. Finally, he throws in a few partial songs and believes he has created the best of all three theater genres. Alas, he has not. The story: A theatrical troupe consisting of a director, producer, composer, lyricist, tenor, chorus girl and comedian are all gathered at the home of financial backer Elsa Von Grossenknueten (I told you so) in order to convince her to invest in a new show. However, before they arrive we see the woman’s maid murdered by a hooded figure and stashed in a closet – only to see this same maid reappear alive and well in short order without any real explanation. We then find out that Elsa Von Grossenknueten (Ok, last time) received a box belonging to Bebe, one of three murdered chorus girls all from the same show, and while we never find out how Elsa and Bebe are connected or why the box was sent to Elsa, we learn that a police officer is in the house pretending to be a household employee but is really there to find the killer, known as the Stage Door Slasher. Another standout performance was given by Michele McCawley as lyricist Bernice Roth. Bernice turns to liquor as the mysteries deepen and McCawley’s timing and delivery are truly spot-on. I also liked Keith R. Smith as director Ken De La Maize, even though Ken is relegated many times to droning on about the stars in movies he’s directed that no one has ever seen. Breanne Brennan as the maid also has some great moments in a very challenging role. The faults with this show belong to the playwright. It did make it to Broadway – and to Waukesha Civic’s stage – so obviously the play has some fans. Director Carol Dolphin tackled a hard script and is commended on her work in this production. Scott Prox’s clever set design worked very well. 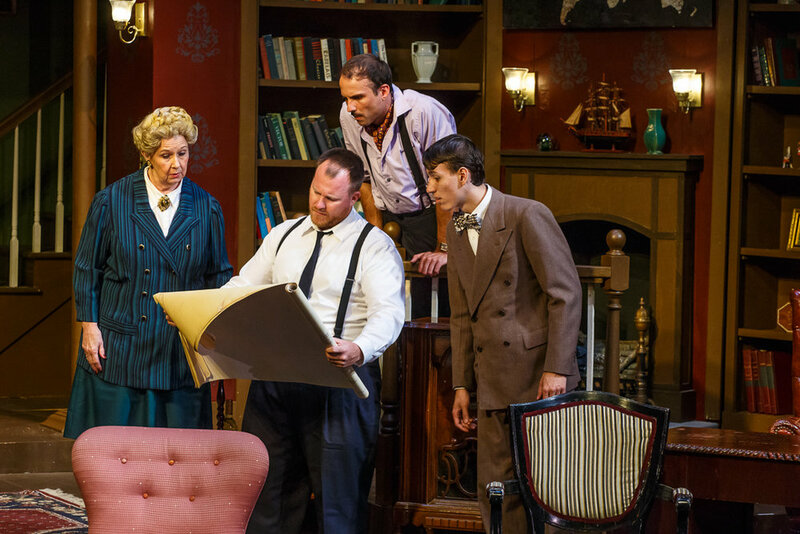 “The Musical Comedy Murders of 1940” runs through September 30.